The former Spain boss now seems certain to lose his job in the wake of a humiliating defeat in a match crucial to his chances of survival. His side conjured something of a revival in the second half but ultimately they were sunk by an irresistible Barca performance, and it now appears only a question of when he will be fired. Philippe Coutinho slotted in and Suarez converted a penalty, awarded by a video assistant referee decision for Raphael Varane’s foul on the Uruguayan, for Barca’s half-time advantage. Marcelo chested down and finished to give Real hope, but Suarez’s header and chipped finish, followed by Arturo Vidal’s header, completed the rout. The visitors had begun the day within four points of Barca, but now trail them by seven and find themselves ninth in the table after 10 matches. Ernesto Valverde’s side, winners of seven league titles from the past 10, are top of the league, leading Atletico Madrid by two points. European champions Real began the post-Zinedine Zidane and Cristiano Ronaldo era impressively under former Spain boss Lopetegui, but since then the mood has shifted dramatically. Before Sunday’s match, everyone, except those with any official connection to Real Madrid that is, was saying the same thing: Lopetegui was set for the sack and only a handsome win in El Clasico could save him. Even then the consensus seemed to be that only a wide victory margin – a 5-1, for example – would do the job. In the second half, his side might easily have drawn themselves level on more than one occasion but luck did not run their way. Winners of the past three Champions Leagues, they were looking desperately short on confidence, but emerged from the break transformed and almost dragged themselves level in a 10-minute spell of clear superiority. First Marcelo poked home from close range after good work by Isco and substitute Lucas Vazquez down the right, before Luka Modric clipped the inside of the post and Karim Benzema missed with a header. That period of dominance was reminiscent of the 1-0 defeat at CSKA Moscow in the Champions League where they had 23 shots at goal and hit the post twice, and last weekend’s 2-1 home defeat by Levante, where they had 33 shots, hit the woodwork three times and had a goal ruled out by the video assistant referee. But ultimately, none of this will count in Lopetegui’s favour. Madrid have now failed to win in their past five La Liga games, drawing once and losing four, their worst run since May 2009 under Juande Ramos, who lost six in a row at the end of the 2008-09 season. In the absence of Lionel Messi, the question was who would be Barca’s talisman? Ousmane Dembele, the £135.5m France international forward? Or Coutinho, signed for £142m? In the end it was Suarez who stole the show and defined this classic Clasico encounter in the Argentine’s absence. His second goal was perhaps the most vital to his side, as it restored a two-goal cushion following significant Real Madrid pressure, but his third, Barcelona’s fourth of the night, was by far the most stylish. The former Liverpool striker dinked a wonderful chip over Thibaut Courtois with Real Madrid ragged at the back. It seemed to mark the point of humiliation that Barca’s fans behind Courtois’ goal had been dreaming of, and the reaction in the stands matched that of the players on the pitch: sheer glee as they watched their rivals suffer. Late substitute Vidal’s header provided the final painful blow, and Dembele even came close to adding a sixth in injury time. The European champions had simply crumbled. And who, now, can suggest Lopetegui is the man to rebuild them? Excluding Lionel Messi, Luis Suarez is the first Barcelona player to score a hat-trick in El Clasico in La Liga since Romario in 1994. Also not counting Messi, Suarez is the first Barcelona player to score a penalty in El Clasico since Ronaldinho in April 2006. There were 30 passes in the build-up to Philippe Coutinho’s goal for Barcelona against Real Madrid, the most of any goal in El Clasico in La Liga since at least 2005-06. Real Madrid have conceded five goals in a competitive game for the first time since November 2010 against Barcelona in La Liga (5-0). Barcelona are unbeaten in each of their past 42 league games at the Nou Camp in (W34 D8), their longest such run since February 1977 (67). 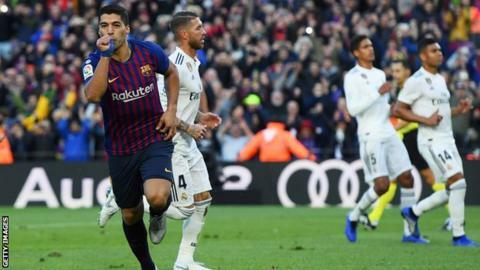 Barcelona’s Luis Suarez has scored nine league goals against Real Madrid since his debut in the competition during 2014-15, more than any other player in that time. Barcelona have scored in each of their past 22 league games against Real Madrid in La Liga (53 goals total), equalling the best scoring record in El Clasico history in the competition – Real Madrid (22 games between 1959 and 1969). Real Madrid have failed to win in their past five La Liga games (D1 L4), their worst run in the competition since May 2009 under Juande Ramos (five defeats). Marcelo has scored in three consecutive games for Real Madrid for the first time ever in all competitions. Real Madrid goalkeeper Thibaut Courtois has conceded 19 goals against Barcelona in La Liga, more than against any other side in the competition.